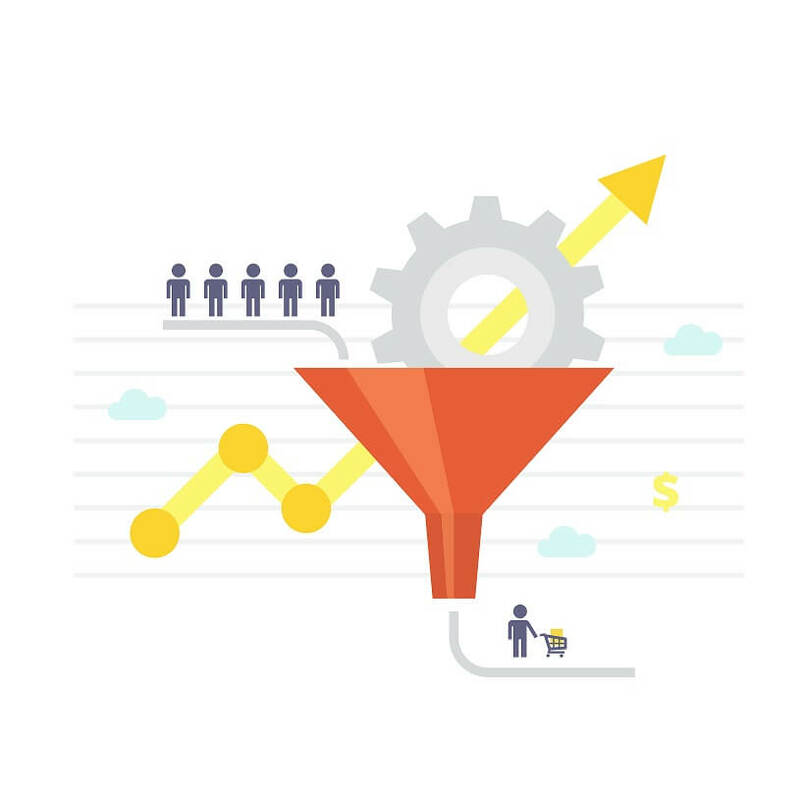 The idea of a “sales funnel” can sometimes sound more complicated than it really is. Just consider how many images are out there when you Google “lead generation funnel.” What you see doesn’t look simple at all. Instead, it looks like a number of steps—all of which look like a lot of work in order to build them all. You’re just sitting here wondering how to build a great web presence in the first place. A sales funnel? That might as well be rocket science. The good news is that sales funnels don’t have to be that complicated. There are plenty of other steps you can insert in there—such as “nurturing the lead”—but chances are, you can file those as sub-points under any one of the above. That’s it. That’s all a lead generation funnel has to be. Still sound difficult? Still not sure how you would go from knowing these simple steps to turning them into real, viable web pages that attract more conversions to your business? Let’s get into the nitty gritty and learn how to put together one of these sales funnels—from scratch. It’s not as hard as it sounds. That’s it. It doesn’t have to get more complicated than that. What exactly do I mean by “great marketing”? That’s where you can add all sorts of steps into your sales funnel. You could include social media marketing in your marketing. You could include SEO. You could rent a billboard or plant a business yard sign out front. Heck, even Superbowl commercials fall on the “marketing” side of this equation. They’re just the tip of the spear, so to speak, when building a sales funnel. The other side of the equation is “great value.” This, too, can be broken up into a bunch of different categories. Newsworthiness: A simple unusual story can draw in attention because it has news value or entertainment value by its own virtue. This is why you see so many businesses striving to create “the world’s largest pizza” or the “largest cookie.” It’s what businesses do to attract attention and start off the first step in a new sales funnel. Informative value: Many companies employ marketing strategies dependent on giving people information. For example, there are print companies that generate local news magazines for specific communities, funding themselves with advertisements. By concentrating first on informative value, they’re able to establish a foothold in the community. Entertainment: If something is funny enough, or entertaining enough, “word of mouth” can spread. This is how comedians rise in popularity: they’re entertaining, and people spread the word about how entertaining the comedian was. But your business doesn’t have to be performing standup to take advantage of the same basic fact: people want to be entertained. The ideal way to draw in new customers is to accomplish both value and marketing at the same time. And keep in mind that there are many ways that you can accomplish these yourself—they don’t have to be restricted the bullet points above. A radio ad is a form of marketing; a podcast is a form of value. Just remember for future steps that you have to have either one or the other—preferably both—to kick off your sales funnel. If you’ve completed step one, you’re already ahead of most of the world. Many businesses are simply trying to figure out how to turn step one into overdrive. But you can have just as valuable results with step two. Now it’s time to direct attention. Earlier on, you saw the idea of a “hook.” You also saw the idea of adding value. Both of these are strategies that help you direct a potential customer’s attention to what they need to know: that you can solve their problems. That’s the essence of a hook: you know your potential customer’s problem, and you’re ready to fix it for them. That in itself can be a very tantalizing combination. The first part—the hook—is when you capture their attention fully so that they’ll listen to what you have to say next. The second part—adding value—is what convinces them that you’re the company that can best solve their problems. This isn’t to mean your business has to sound like it’s selling snake oil. But you do have to position your company as one that is worthy of the trust and responsibility they’re looking to give out. Especially in the mortgage and insurance industries. Also known as “closing,” or the “call-to-action,” or simply “making the sale,” this is the critical point in your sales funnel when you essentially ask for the sale to take place. You now have the ability to present the solution and ask for the conversion. Let’s say you captured attention with a popular blog post on your site. In turn, someone who’s interested in what your site has to offer clicks around and finds out that you have all sorts of client testimonials attesting to the fact that you’re great at what you do. You hook their interest with a newsletter signup that comes with a free eBook that promises to guide them through the very process they’re researching. Your newsletter is then automated to send a few follow-up messages that establish your expertise. Finally, it’s time to ask for the sale. This doesn’t have to be a link to an overly elaborate sales letter. In some cases, it can be something as simple as a link. It’s only asking them to become a potential customer—not asking them to fork over a bunch of cash. If you’ve handled every step of the sales funnel the right way so far, it should only feel natural to click ahead. Everything on your site should have some role in the sales funnel. That doesn’t mean your sales funnel should be complicated, however. In fact, your sales funnel might even contain the three steps you just read. But when you put up something new on your site, you should have an idea of the role it will play in your sales funnel. And you should use that role to determine the next step for your audience. What’s the next step for you? Consider taking the next step yourself with a simple free trial of leadPops. This will help you establish the web presence you need to build a sales funnel that generates more leads for your business.